If you’re writing Java code the chances are you’re probably using Maven. The popular Java build tools, Ant; Gradle; and Maven itself; use Maven repositories in order to resolve dependencies required by the project. Most dependencies you’re going to need will be in the Maven Central Repository or another public Maven repository, but what if you have some dependencies that aren’t? There are several Maven repository servers available for hosting your own Artifacts and they make it reasonably straightforward to do. Nexus and Artifactory are two commonly used examples. But what if you’re writing an Open Source project; a side project that you don’t want to pour money into; or just don’t want the hassle or expense of running servers? Well GitHub pages can help. 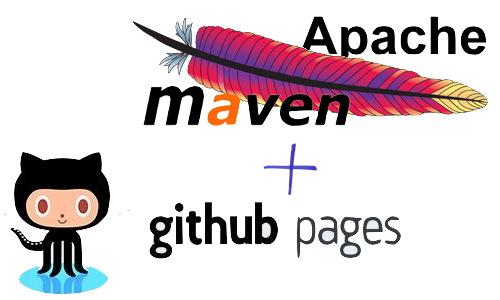 Maven repositories are just a series of Artifacts; their hashes and metadata files, each of which have a known format and have a specific URL format. There isn’t anything particularly special about a basic Maven repository where restricting access etc. isn’t a requirement. Since all we require here is a set of files to be hosted we can use GitHub pages to host them. So now we just have the problem of creating the correct metadata files in the correct location. This is where we can use a build tool to do the work for us. So long as the chosen build tool can deploy to Maven repositories on the local disk rather than over HTTP it will work, in my case I’ve chosen Gradle since it doesn’t rely on lots of crazy XML to get the job done. Running gradle uploadArchives will then copy the artifact to the ‘repo’ directory and calculate the required metadata. This can then be committed to and pushed to the remote gh-pages branch and it’ll all be hosted publicly. To use the artifact(s) add http://<github-user>.github.io/<repo-name>/ as the URL for your Maven repository in the project that’s using the artifacts. Now you have yourself a publicly hosted Artifact used by your project. Magic! So the solution above has a lot of hardcoded values, the path of the artifact and it’s version for example. To make this a more generic script that can be used again and again we can accept the relevant information via arguments. The easiest way to do this in Gradle is using properties which can be set via the command line by using -PSOME.PROP=some.value. The example above has been simplified for the purpose of this post so please check out the full build script. To now deploy an artifact we can run the command gradle -PdepGroup=my.artifact.group -PdepVersion=1.2.3 -PdepArtifact=MyArtifact -PdepFile=/A/path/to/MyFile.zip. To deploy another artifact we use the same command but change the arguments. The previous commands require Gradle to be installed. Gradle helpfully provides a Wrapper that can be checked in to source control which will download the required version of Gradle, so no need to have a pre-installed Gradle. It also has the added advantage that the version of Gradle used is tied to the build file version, so no more finding the build fails because you have the wrong version of the build tool installed. Rather than reproduce the Gradle wrapper documentation here I’ll let you read the Wrapper docs yourself. In a nutshell, you install Gradle on one machine so you can use Gradle to create the wrapper; create a build file with the wrapper task; run gradlew wrapper to add the wrapper script and then commit it to your repo. From then onwards you use the wrapper, via ./gradlew, to run Gradle rather than the gradle command. You can download the code required for a Gradle controlled maven repo from https://github.com/andyberry88/gh-pages-maven-repo. Just fork the project and clone locally. Run the Gradle wrapper, for example ./gradlew -PdepGroup=my.artifact.group -PdepVersion=1.2.3 -PdepArtifact=MyArtifact -PdepFile=/A/path/to/MyFile.zip, to add your Artifact to the repo then commit and push to gh-pages.